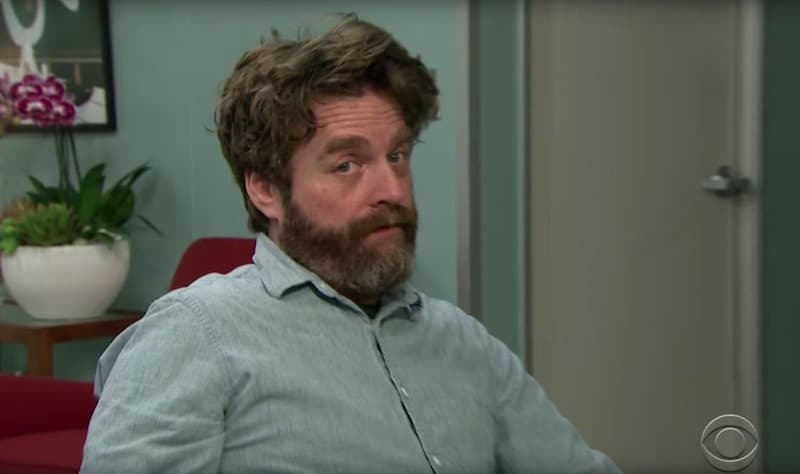 Zach Galifianakis — one of the voices behind The Lego Batman Movie — dropped by James Corden’s show on Wednesday night. But even though it’s currently the highest-grossing flick in the U.S., the Late Late Show host was none too pleased with the comedian’s “surprise” appearance on his show. In a segment dubbed The Zach Galifianakis Problem, the actor pops into Corden’s room while he’s hammering away on his laptop. Galifianakis is befuddled that the confused Corden doesn’t welcome him with open arms. The scene flashes back to a previous episode in which Corden told guest Galifianakis that he was welcome to “come back whenever he wants”. The comedian took the invitation literally, setting off a chain of events that led to Galifianakis showing up in Corden’s office with a briefcase in tow. “I meant come back as a guest, not come back literally,” Corden says. Zach then looks at the camera, which freezes frame. Up pops the caption “The Zach Galifianakis Problem”. An amusing montage of behind-the-scenes moments ensues, including Galifianakis slurping loudly on a soda while Corden’s team is brainstorming ideas for the show, the writers whispering while a sleeping Galifianakis snores on a couch with cucumbers on his eyes, and the comedian blending a margarita — at 10 in the morning — while Corden is on the phone. But Corden counters: “Bad energy. Makes me feel uncomfortable. Hates my music. The list goes on. I made a list” — then up flashes said list. Corden reaches his (British) wit’s end when he steps out of the shower to find his unwelcome guest taking a selfie on the toilet. The two eventually confront each other, with Corden apologizing as Galifianakis packs up his belongings — and some of Corden’s too (including a framed photo of him and his family). As a dismayed Galifianakis departs, Corden casually mentions, “You’re welcome to stop by anytime you want” — and thus restarts the whole “Zach Galifianakis Problem”. The Late Late Show with James Corden airs weeknights at 12.37am/11.37pm c on CBS.